You are exhibiting at WantedDesign this year. 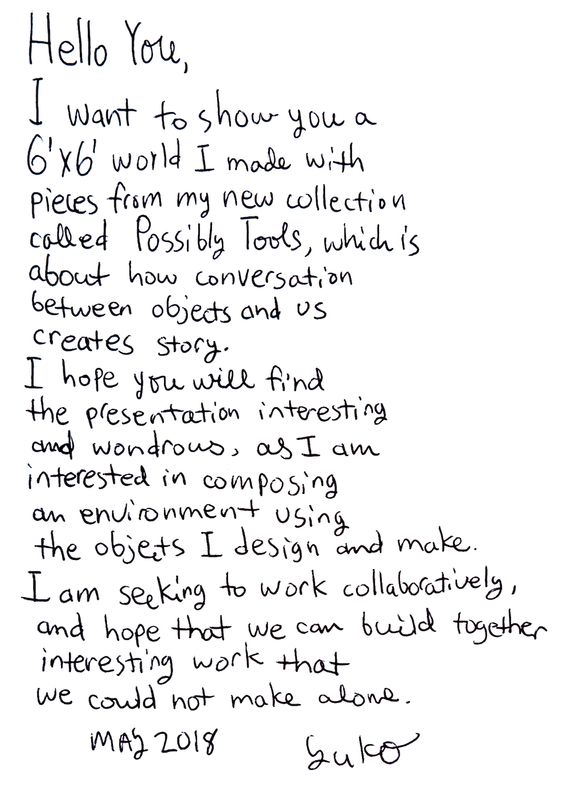 Why have you chosen to align yourself with WantedDesign? My focus now is on developing my business as an independent maker. Last year I took a sabbatical from Donghia where I designed furniture and lighting for ten years, to develop my own creative work through design and art projects in ceramic. During this time I focused on developing my skills in different ceramic techniques and showing my work in various outlets; I made custom pieces for restaurants and cafes, retail shops and hotel guest rooms and exhibited sculptures and installations in art shows. This year I want to extend my work beyond just objects and contribute in creating space with objects I make and design. At WantedDesign I want to share my work with the design community, especially to interior designers and architects who work in creating space. Is your inspiration typically derived more from yourself or from a client (i.e., if they have commissioned you to make something and have provided specific parameters)? Do you prefer one scenario over the other? To me how we process the ideas have a bigger role in creating good work than where the inspiration is coming from. Inspiration can come from anywhere. I would like to work in a way where the client and I are collaborators so we both bring our knowledge and ideas and achieve more than each of us alone could make. I'm interested in making work that leads me to the next project and next idea, and not only satisfies the immediate needs so respectful work relationships and being able to try new ideas becomes important. Showing new ideas can be uncomfortable but to be able to communicate with future collaborators I aim to show the work I want to be doing and not what I feel is expected. Social media and art and trade shows give prospective clients access to my work so they can know my interest, which makes the collaboration go much smoother. How mindful of the marketplace are you while designing? Do you look for holes in the market to fill or just design to satisfy yourself? I want a conversation with the audience through my work. I ask myself three questions: is it interesting? Does it give you a sense of wonder? Who do I want to speak to? I want to work on a project that is not just about an object but about space, ideas, and feelings surrounding the objects. The new work I'm showing at WantedDesign is presentation material for what I think is interesting and if you think it's interesting I'd like to hear from you and want to work with you. Everyone is different, like your voice is different from mine. So I believe that your work is unique and it's not only about the projects you create but also the service and relationship you build with your clients. It requires practice to cultivate your expressions. So my focus is on cultivating my own expressions than finding a niche in the existing marketplace. I try not to compete with other products in the market because to me it is the easiest way to produce similar work. How important has branding been to you and has that changed over time? My branding has evolved: In the beginning I wanted to seem correct and proper so it was about consistent logo and typeface and email addresses that would make me appear like a group of people dedicated to a certain task, when in fact it was just myself. Now I emphasize that I am an independent maker infused with personality. It is important for me to present business as how I want to work, especially because I want to build a long-term relationship with clients. I incorporate hand drawings and handwritten texts in my communication materials because I think they can communicate what digital drawings and texts cannot. I enjoy seeing other's hands in their work as well and would like to see more of them in the world. As now many things can be done digitally so easily the looseness of hand drawn letters and lines look rather fresh to me. How mindful of trends are you? Do you endeavor to set them as you design or do you blissfully ignore? What do you think are the current trends? We can talk about styles as trends but also we can look into the emotions and the mood of our lives. I like investigating the core message and the emotions behind those trends, rather than being given trends as visual guides which are just the results of those emotions and reactions to what's happening around us. And once I come up with my theory I can apply that not only to colors and textures but anything that goes into the work. It is a more fun way to create for me. What do you contribute to building the next generation of makers? I organize a monthly salon at my studio where makers get together and share their creative projects, the inspiration, the process, the problems they face and how they overcome them. We have had not only ceramic makers and other visual artists like painters and sculptors but also a poet, game designers, research scientists and chefs who came to share their personal story. In creative work I think it's important to have a supportive group where we contribute our knowledge and ideas, learn new things and inspire each other. When you feel alone and receive no feedback it becomes difficult to carry on and becomes easy to ask rhetorical "what's the meaning of doing this" questions. Another project was a blog I kept in 2017 called 365 Days To Make Anything, in which I wrote daily about my experience working independently for a year. When I decided to leave my work many people came to me to said they wished they could do it too. I hope that the blog would be helpful for those who would like to pursue working independently. I work in a studio building where many individual business and artists work. I often get asked if we are competitive in the such close proximity and this question surprises me because we are the opposite. We need a supportive community. If I receive a project offer that is not a good fit for me but is for other makers I know I refer the client to them. I am happy to see other makers grow. I believe their growth means bigger exposures and more opportunities for the overall community of independent designers and makers. How do you work on your business to be a sustainable practice as these days the traditional mentor-mentee relationships have been changed? Stay healthy mentally, physically and emotionally. I am lucky to be surrounded by supportive friends who encourage me to do what I do. Not one person said I would fail and should quit, except an artist I met at an art show who told me it is not possible to make a living as an independent maker but I just met her and she did not know me. I don't agree with her. One of my friends in business has talked to me about how business fails when a creative director becomes a business decision maker and backed up his statement with convincing examples of fashion industry. So when I want to direct both the creative and the business, what would I do? I believe that people are capable of recognizing good work. If the work has values to others, they will pay for the work. Being busy is easy. Making good work is not. I focus on making good work.